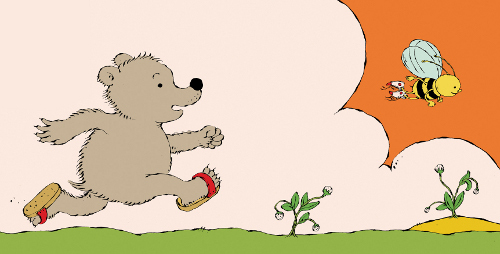 Last week at Kirkus, I chatted it up with author/illustrator Sergio Ruzzier (ooh, he’s updated his website all spiffy-like) about his two newest picture books, Bear and Bee (Hyperion, March 2013) and Eve Bunting’s Have You Seen My New Blue Socks? (Clarion, March 2013). That Q&A is here, if you’re interested, and today I follow up with some art and early sketches and dummy images from Sergio — with some words from him about how he went about building these picture book spreads. I thank him for sharing. Nancy Carpenter is quickly becoming one of my favorite illustrators. 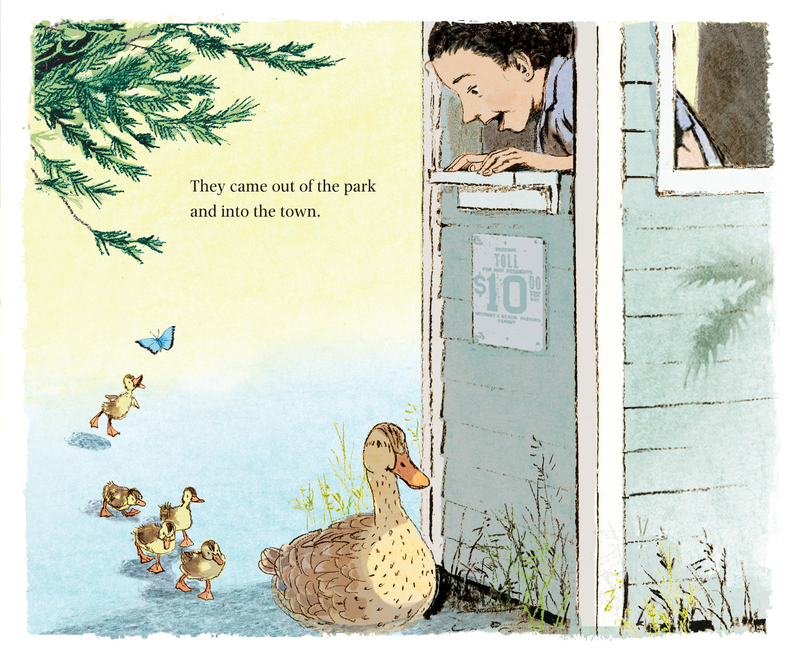 And in her latest illustrated title, Eva Moore’s Lucky Ducklings (Orchard Books, February), what is described as “a true rescue story,” she renders her illustrations via charcoal and digital media, the former being a medium I love to see used in picture books (and which she does very well). 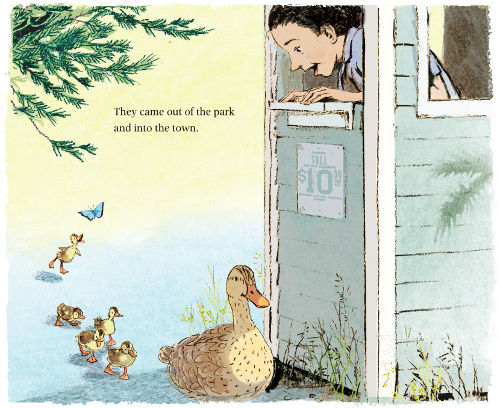 I think it’s safe to say that Lucky Ducklings will be one of 2013’s great picture books, though it’s still early in the year. This book works on every level, and I don’t think it’ll meet many children it won’t straight-up delight. 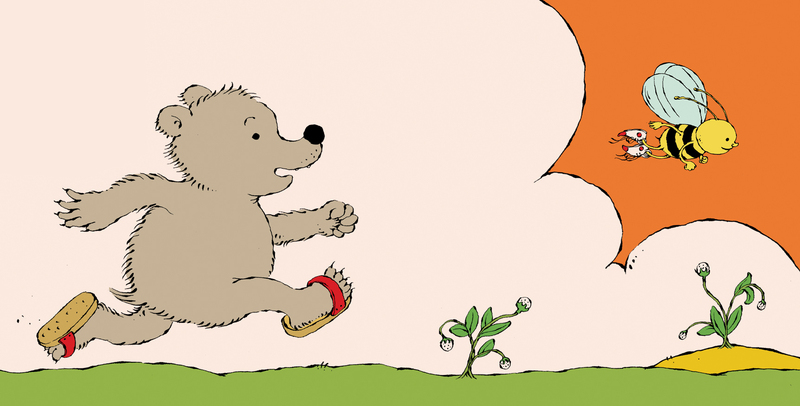 Today’s featured picture book is the work of a debut artist. You Byun grew up in the United States, Japan, and Korea and studied at the School of Visual Arts in New York City. 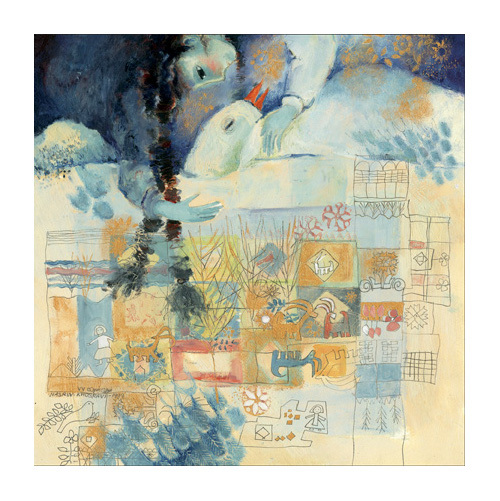 Evidently, her work was awarded an SCBWI Illustrators’ Portfolio Award, as well as the Tomie dePaola Illustration Award. Yesterday over at Kirkus, I chatted briefly with author/illustrator Sergio Ruzzier about his two new picture books and what’s next for him. 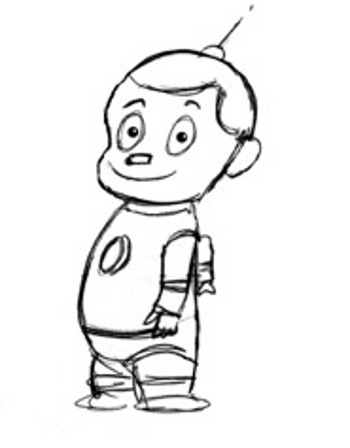 That is here, and next week here at 7-Imp, I’ll have art and early sketches from each book. Today, I’ve got some thoughts on a new historical fiction picture book, Deborah Hopkinson’s Knit Your Bit: A World War I Story, illustrated by Steven Guarnaccia. That link is here. 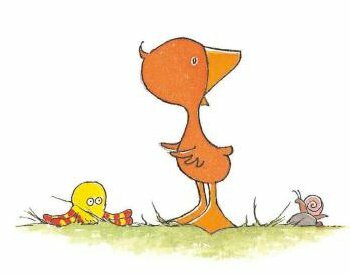 Pictured here today are illustrations from Swedish illustrator Eva Eriksson from Rose Lagercrantz’s My Happy Life (Lagercrantz is also Swedish), a chapter book release from Gecko Press, a New Zealand-based publisher of English versions of award-winning international children’s books. Originally published in Sweden in 2010, this book was released here in the U.S. last month. I wrote about it here last week at Kirkus and am following up this week with a bit of art from Eriksson. 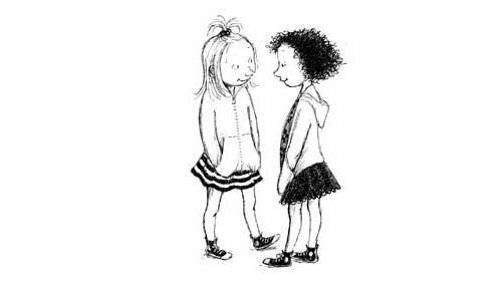 The Niblings is a new blog consortium, over at Facbeook and Twitter, representing Seven Impossible Things Before Breakfast (Yours Truly), A Fuse #8 Production (Betsy Bird), Nine Kinds of Pie (Philip Nel), and 100 Scope Notes (Travis Jonker). We considered calling this page “100 Notes on Why 7 8 9,” but it sounded too much like a math page. And when Philip Nel suggested “The Niblings,” we all fell hard for it. Here’s a glimpse at some beautiful illustrations I simply must share. 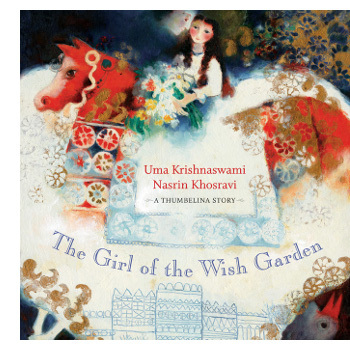 Uma Krishnaswami’s The Girl of the Wish Garden: A Thumbelina Story, illustrated by Nasrin Khosravi, will be released next month by Groundwood Books, but I was lucky enough to see an early copy. This book is being published after Nasrin’s death and in her memory, but more on that below. The lyrical, poetic writing here is striking, and the artwork is simply gorgeous. This is not a book that presents the seamless merging of art and text, as with a traditional picture book. More like an illustrated story or poem, it presents the text on the left of each spread, and one ethereal, Chagall-esque illustration on the right. For each and every spread. 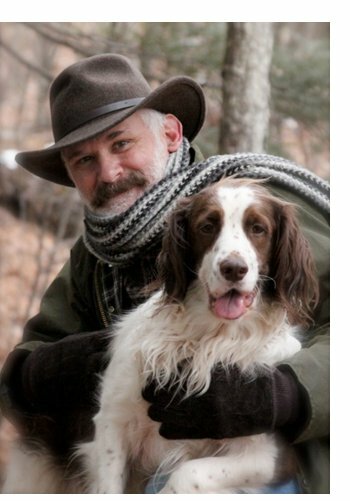 I’m shining the spotlight this morning on a nonfiction picture book chock full o’ charm. It’s called The Beatles Were Fab (and They Were Funny), written by husband-and-wife writing team Kathleen Krull (who, evidently, was once such a ginormous Beatles fan that she owned pieces of the sheets the lads slept on) and Paul Brewer, to released next month by Harcourt. It’s illustrated by Stacy Innerst (featured previously at 7-Imp in 2011), who wanted to grow up to be Ringo Starr, and I’ve got some more of his illustrations below. Those words are from author/illustrator Dan Yaccarino, whose newest picture book, Doug Unplugged, is out and about in the world, as of this week. 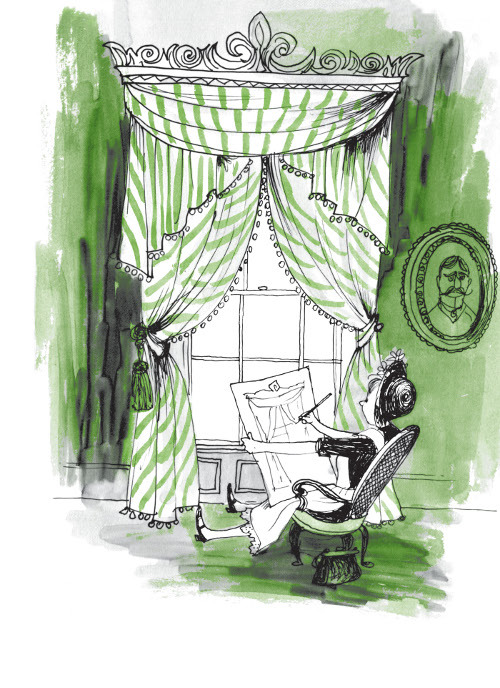 And it was the subject of my Kirkus column last week, so I’m following up today with some art and sketches from the book (below). I thank Dan for sharing. Today at Kirkus, I take a look at a chapter book import, Rose Lagercrantz’s My Happy Life, illustrated by Eva Eriksson. Originally published in Sweden in 2010 (both author and illustrator are Swedish, too), it was released here in the U.S. at the end of last month. That column is here.